Summary : I actually liked this tea. Yeah, it's no substitute for a real loose-leaf mint tea, as the mint taste is on the light side. But still, this is a tasty tea and enjoyable to drink. Review : After my happy experience with Liptons Orange & Spice Flavored Black Tea, I was rather looking forward to this tea. I guess what was surprising me about these flavored black teas that came in the sampler box was that the strong and frequently overpowring black tea taste was mysterious absent - allowing the infused flavors to actually be tasted. That has long been a pet peeve of mine in the flavored black tea department - I could never taste the flavors due to the strenght of the black tea taste. And so, with an open and somewhat hopeful mind, I opened up the bag and gave it a try. Admittedly, you won't be impressed at the first meeting with this tea - there is very little aroma, although what there is does indeed smell like mint. Liptons Mint Flavored Black Tea contains the following ingredients : "Fine imported black tea leaves, natural mint flavor (contains soy lecithin)." 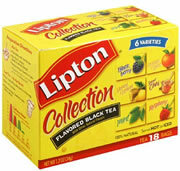 Here is how Lipton describes this tea on their website : "LIPTON blends pure black tea leaves with natural mint flavor to create a delicious and refreshing all natural tea that provides a healthy dose of protective flavonoid antioxidants." Well, by and large I'll agree with Lipton in that this tea is indeed pretty refreshing. The taste of this tea basically is of "light mint." While this tea can in no way compare to the "mint taste" found in a similar loose-leaf tea, that doesn't mean that this tea is bad. Far from it, actually. You see, what I realized about Liptons Flavored Black Teas is that, well, you can't taste the black tea at all! Someway, somehow Lipton essentially strips out the taste of black tea. That has been my pet peeve with other flavored black teas - the black tea taste all but wipes out whatever was infused into the tea. Granted, I realize that the reason you can't taste the black tea that much in this tea is due to the fact that the black tea leaves are tiny and are of poor quality (thus leading to a very weak black tea tastes that gets "buried" under the mint infusion). But you know what...who cares? Long as the tea is good and pleasant to my taste buds, I really could care less if the leaves are "high quality." In short, I'm not a tea snob that will give a tea short shrift based on the leaf quality alone. For me, the taste of a tea is everything, and in this regard, Lipton's Mint Flavored Tea is actually pretty good. Recommendation : Yes. If you like mint and flavored black teas, you'll enjoy this tea to some extent. The tea is no replacement for a quality loose-leaf mint tea. And the traditional strong taste of black tea is all but missing here - for better or for worse, depending on your perspective. Still, this tea is enjoyable to drink.